On March 9, 1963, twelve Irish Terrier fanciers and breeders met for the first meeting of Irish Terrier club of California in Oakland. Prominent Breeders in the early years included: Killybegg's Irish Terriers (Mary & J. O'Brien), Rockmar Irish Terriers (M. & Rockwell Stone), Rockledge Irish Terriers (Marion & Linda Honey), & Sheehan's Irish Terriers (Dennis Sheehan). Dennis Sheehan was elected the first president of the club. In 1965 the club split into two clubs, one for Northern California and one for Southern California. In 1968 ITCNC held two matches and the first specialty show in 1969. In 1979 ITCNC held their first independent specialty show in conjunction with Combined Terrier Specialties. In 1981 club hosted the ITCA Traveling Specialty jointly with Sir Francis Drake Kennel Club Show. In 1985 the club added a second independent specialty show and sweepstakes in April in Sacramento in conjunction with the Northern California Terrier Association's group show. In 1991 the club held the first ever Irish Terrier Obedience Trial at its Spring specialty with an incredible 14 entries. Membership of the club is unrestricted, so all Irish Terrier lover are welcome to join. ITCNC Champions and Title Holders 1980-2012 Photo Book. Board member Nancy Mahan has collected photos of ITCNC Irish Terrier Champions and Performance Title Holders from our members and has created a 11x14 inch photo book. 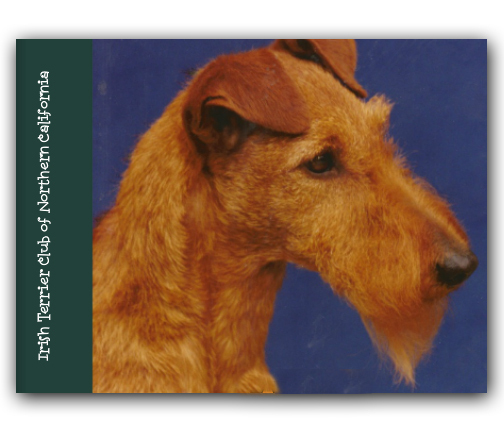 This book was made for our club as a historical document of Irish Terriers bred in California. The book is in full color and is organized by decade and breeder and is 90 pages in length. The ITCNC has well over 100 members. Many are actively training and showing their dogs in obedience and breed competition. There is a great support group of experienced members who help new IT owners with grooming and training. Their owners handle most of the Irish shown in Northern California. Several members' dogs have at least one obedience title, and many are also Breed Champions. Click on member names below to contact us via email.